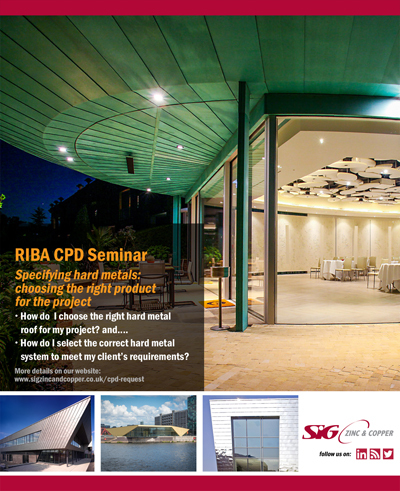 This seminar will equip you with a better understanding of hard metal roofing and cladding systems and the different options available; zinc, copper and stainless steel. The seminar will also look in-depth at roof and façade systems options and their relevant construction methods. Specifying hard metals is a growing market and currently there is a considerable amount of disjointed information about hard metal roofing and cladding options. We have created a seminar to help you and your staff demystify the confusion surrounding hard metals. What will we learn about Roof Specification and Design? The new seminar sets out a step by step process to help you arrive at the best solution for your roof or cladding project. We look at the issues to be aware of when specifying hard metals, how to establish the client’s brief and the benefits of using hard metals. Provide sources of further information and advice. The seminar is 60 minutes long including questions, and qualifies for double points on your CPD record. We will also meet the cost of a lunch for you to order for your staff who attend, plus the presenting specification manager, up to a maximum of £6.50 per head.